Matt Bullivant pictured recovering from his injuries after he fell through a balcony on his honeymoon. A new husband suffered a honeymoon from hell when he was seriously injured after plummeting head-first through a rotted balcony. Luckless newlywed Matt Bullivant (36), from Peterborough, had only just arrived at the bed and breakfast with his wife Marilyn (51) when he went out to catch a glimpse of the surroundings. Matt Bullivant pictured recovering from his injuries after he fell through a balcony on his honeymoon. . But the flimsy balustrade cracked under his weight and he fell 15ft - shattering his right hand and spitting open his head. The rest of his week-long honeymoon was spent in hospital. The guest house owners Troy and Julie McCann, aged 48 and 49, pleaded guilty at Truro Magistrates’ Court to failing to properly maintain the balcony and were each ordered to pay more than £7,000. And speaking after the case, Matt said he feared his married life could have got off to an even worse start - and said the incident could have been fatal. Matt, who has three children from a previous relationship, said: “We had only been there for about 20 minutes. “I looked out onto the balcony, put the kettle on then went back out onto it. “I put my hand onto the top of it [the balcony] - it just cracked and I went with it. The balcony where Matt Bullivant fell . Mr Bullivant had picked the Chellowdene Guest House in Falmouth, Cornwall, for his honeymoon and they arrived on September 21 of last year. After standing on the balcony and looking out at the view he came crashing down. Dazed and confused - and covered in blood - he did not know what had hit him. His wife then came running out, closely followed by the hotel owner. Mr Bullivant, who works as a warehouse operative, spent three days in hospital where he received 25 stitches and was off work for three-and-a-half months. He still suffers “constant pain” in his right hand - which has a metal plate in it - and he cannot feel the top half of his back. He said: “I split my head open. My eye lid was hanging off. I have nerve damage in my back. Mr Bullivant is now awaiting compensation for the accident - and has dealt with it through the courts. Troy and Julie McCann, who live at the guest house, were described at court as “highly respected hoteliers” with no previous health and safety breaches. Matt Bullivant and his new wife Marilyn on their wedding day. See SWNS story SWBALCONY; A new husband suffered a honeymoon from hell when he was seriously injured after he plummeted head first through a rotted balcony. Luckless newlywed Matt Bullivant, 36, had only just arrived at the bed and breakfast with his wife Marilyn, 51, when he went out to catch a glimpse of the picturesque surroundings. But the flimsy balustrade cracked under his weight and he fell 15ft - shattering his right hand and spitting open his head. The rest of his week-long honeymoon was spent in hospital. 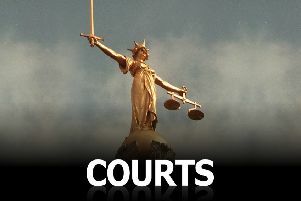 The couple were each fined £4,000 and ordered to pay costs of £3,037 each. Mr Bullivant added: “I was angry with them to start with - they should’ve maintained the property.